A portion of the coupon offer e-mail. Apple said Friday that it would extend its winter promotion of iPhoto books and calendars through March 7 due to issues with its online ordering system. 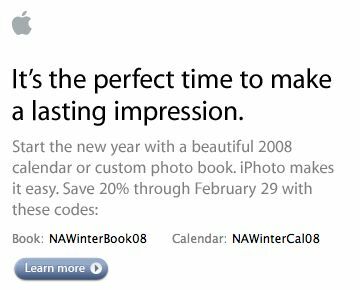 In late December, Apple send out a mailing advertising a 20 percent discount on iPhoto books and calendars through the end of February, with North American users being instructed to use the coupon codes NAWinterBook08 and NAWinterCal08. However, on Friday several iPhoto users reported that the coupon codes associated with the Apple offer won’t be accepted by Apple’s online ordering system.